Here are my Acronicta afflicta… remember how they looked way back when? 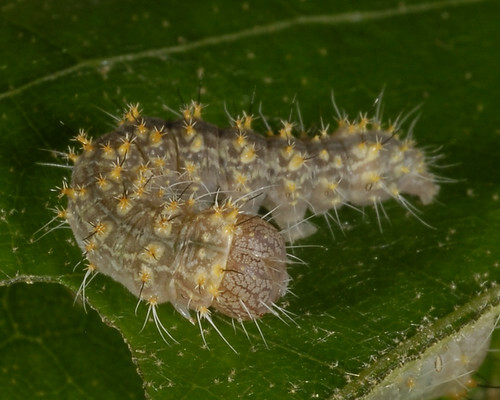 It was only May 31 that they were reaching the second instar… now they’re in their fourth and fifth, and looking quite different. The first few instars only last a few days each, but they’re slowing down now. The afflicta are quite variable – I am observing many colors and shades among my approximately three dozen caterpillars. Some are more yellow, or more striped, or brown, or gray, or pink… bright yellow spines or more orangey brown… what fun! Do you want to see one up close? I am becoming incredibly inspired by my caterpillars. They have such interesting behaviors, beautiful colors and patterns, and of course they are all adorable. And luckily those spikes are all for show (well, at least insofar as they do not deliver venom) so it’s ok if I snuggle them a little bit. I… uh… well… I would if they were bigger! I think I should make some plushies modeled after Acronicta species. Posted on June 15, 2011, in Acronicta, Acronictinae, Invertebrates, Lepidoptera, Noctuidae. Bookmark the permalink. 5 Comments. In every gallery I’ve put up so far I’ve included one of my favorite old images – an Acronicta increta type curling around and staring into the camera. Gallery owners have tried to convince me not to put it up, people have told me they have trouble looking at it… I don’t get it! That big puppy dog head capsule… he’s adorable. I just sent you a container full of Acronicta sp. 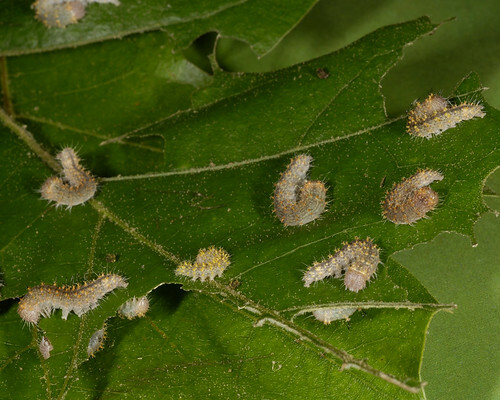 – probably hasta – eggs and early instar caterpillars from black cherry in the Blue Hills. Should arrive at the Lab on Friday. I’ve seen these eggs before, but wouldn’t have known them without your photographs. Thanks. Ooh I’d love to see the increta photo, do you have it online? Looking forward to the new additions, thanks so much! Now that most of my caterpillars are reaching later instars life isn’t quite as hectic and I can afford to deal with little ones again. Did the A. hasta make it? I’m always pretty nervous about sending caterpillars – I guess they were due in today though. I got your goodies today! One dead caterpillar but the others look ok, a few molted on the way. About half the eggs were already hatched (no signs of first instars in the container though), but there are 5 good looking eggs. Thanks! Sad face… all the eggs are hatching into parasitoid wasps. Cute wasps… but… they’re not caterpillars. Oh well!